…like painting a floor. I don't even have a floor that I can paint, except maybe the garage floor. There's a thought! I've saved this photo, found on Design Sponge, for at least 2 years which shows how much time I have for a project like this. I'd also like to get all my family photos scanned so that I can actually use them. I got a coupon for Go Photo yesterday. Have any of you done this – sent off your family photos for scanning? What did you think? You can buy a flip scanner and do it yourself a whole lot cheaper. It converts photos to digital and you can then load them on your computer. So much easier.No worries about any getting lost somewhere in transit. I whole heartedly believe you should not put off what makes you happy today. 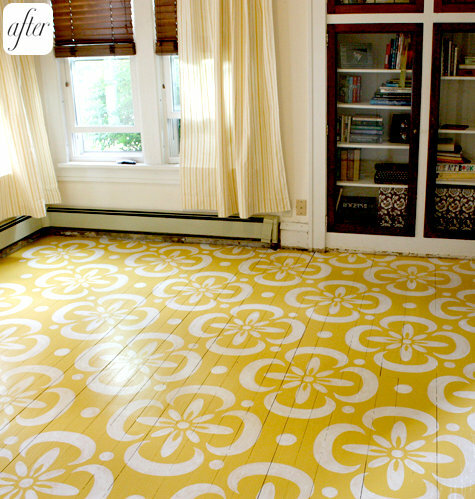 This floor is a perfect example of “if you don’t like it, decorate it.” LoL Judy C sends her best wishes – no advice on the pictures as I still like to have hard copies. i like both ideas…though i agree with marlene, you can DIY. painting the garage floor would not be a restful thing….but scanning photos shouldn’t be too hard. unless you have the stick-to-the-page kind of albums…those are a pain to get the photo off, just scan the whole page.